When I travel, I always take a coat with me. I mean, unless I'm in Vegas in the summertime, there's almost always an occasion to use one, especially on the plane. 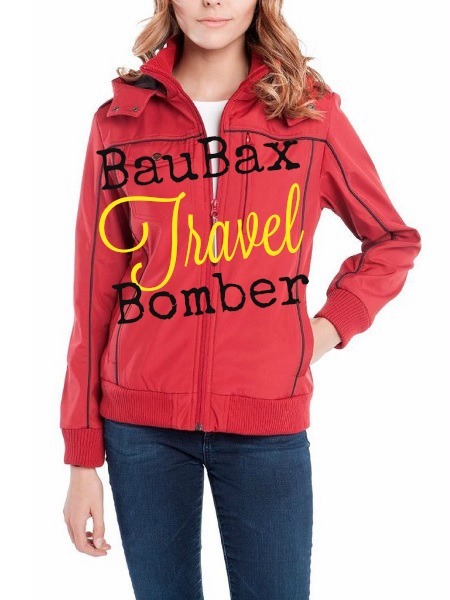 BauBax has created the ultimate travel jacket for you and it comes in several different styles. Their most popular is a hoodie and it may very well become your favorite over your current favorite now. With that in mind, I asked to try the more structured bomber jacket, which has a heavier fabric and is waterproof. The bomber, just like the hoodie, comes with 15 different functions that are unique and all very useful when traveling, whether you're on a plane, train, bus, or even just heading to a festival in your hometown. 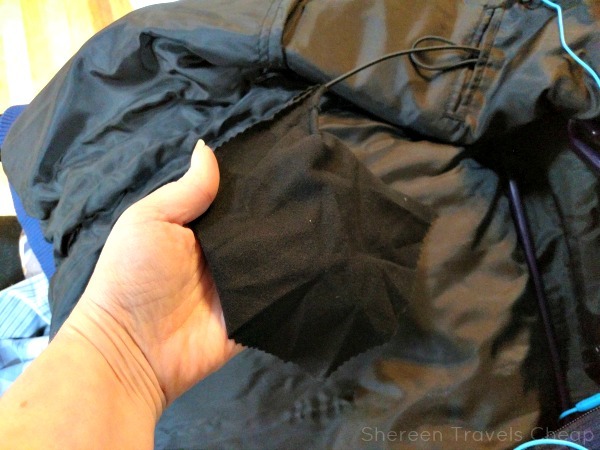 The jacket features 9 pockets, all of which have a function. The design of the bomber is a bit more form-fitting and runs a bit small. 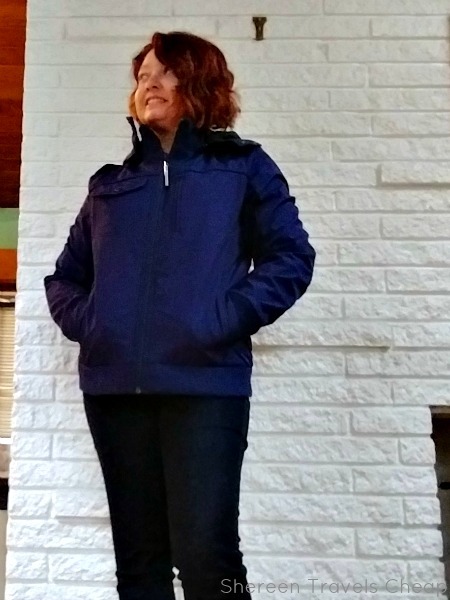 I seemed to be in between sizes, and I chose the large, which fit just a little loose, but will be perfect for layering, especially in the winter and fall and sweaters are necessary. I like my jackets to be a little roomy, especially if I'll be using it instead of a purse, which you can certainly do with this one. Now, I'm short, 5' 1", and this hits me right at mid-hip. If you're taller, it may hit you at your waist. I think it's a comfortable fit and keeps all the important stuff warm. The bomber has these lovely built-in gloves that I love. 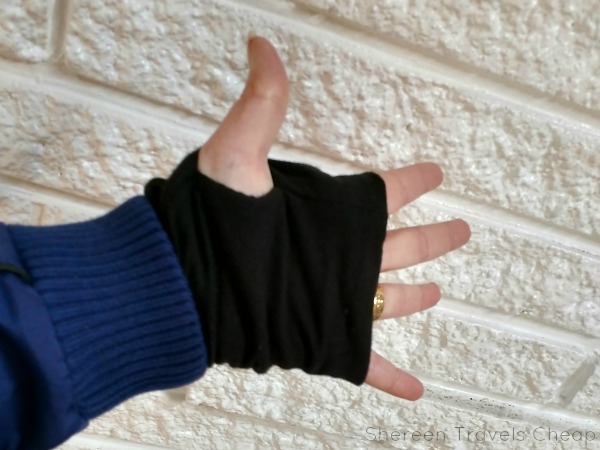 Usually, only outdoor clothing features these, but they really help in keeping your hands warm. It also has hand warmer pockets, lined in this same fabric, to help you stay warm even when outside for long periods. If you don't want to use them, they can easily be pushed back into your sleeves. On the top left you'll find a sunglasses pocket. This also has a fun loop to hang your glasses on when you want them to use them more often than not. Below that pocket is a much larger one that will hold your tablet. You're going to use it on the plane, so why leave it in your bag? 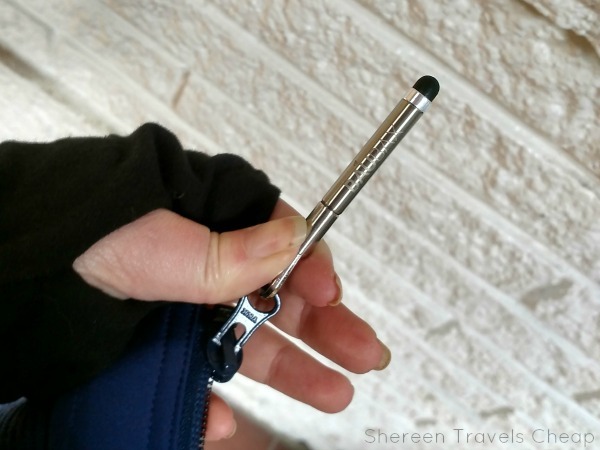 This pocket zips, meaning it won't accidentally fall out when you're reaching down to put your bag under the seat. On the other side on the top, you have a zipper pocket for your phone. 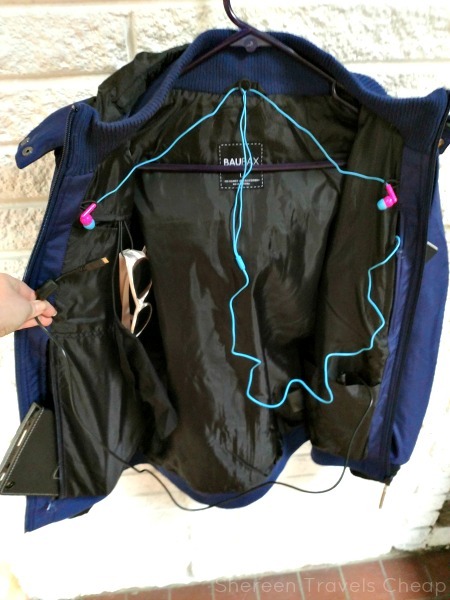 You'll see that there are loops along the jacket, so you can keep your earbuds from jumbling up in a pocket, plus they are out of the way, coming up behind your back and hanging over your shoulders by your ears. You won't get all tangled in the cord, nor will you need to search for them when you want to listen to a movie or music. Below that you have two more slip pockets. 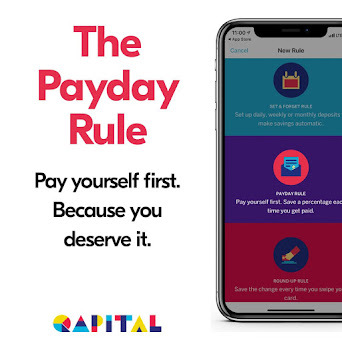 The first is for your battery back-up. The second is for a travel blanket, because you still gotta think about your legs on a cold flight. Your pocket for your glasses also comes with an attached glass cloth. Now you don't have to use your shirt to get clearer vision. That's pretty awesome, right? Aside from your two handwarming pockets, the outside of the bomber has two additional pockets. 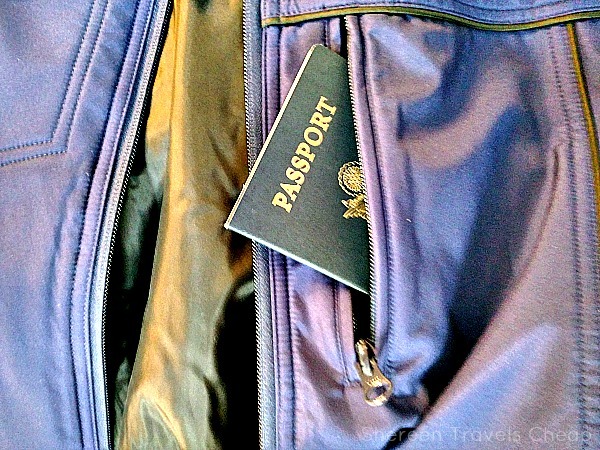 There is a zipper pocket that's the perfect size for your passport. In fact, you could keep more than one in there if you're the responsible one in charge of keeping all the important things safe. Or, when you're out and about, this is where I would keep my Metro Card, or my city pass, or my theme park ticket, or some spare cash for purchasing small items. Anything you need handy that you're going to use multiple times. 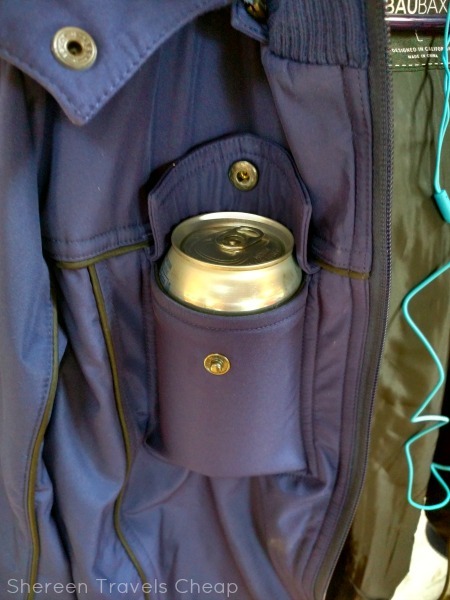 The last pocket is a snap pocket that can double as a drink holder. A small water bottle or a soda can will fit snugly inside. If you're sleeping on the plane, you won't have to worry about spillage, since the pocket keeps your drink upright. It's also nice for walking around, because it lets you keep your hands free. 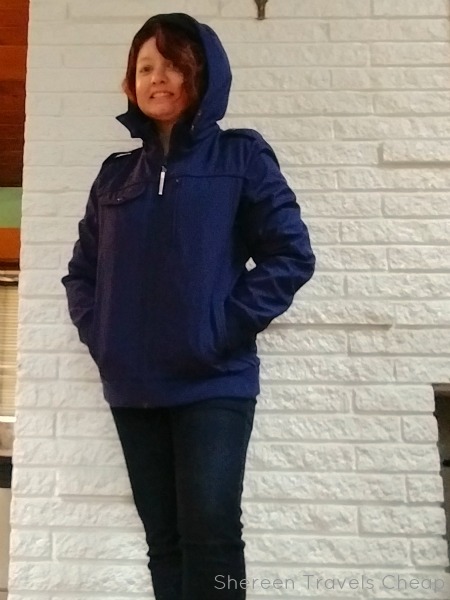 The hood of this jacket zips off if you're not expecting rain and you don't want it attached. I think more coats should have this option, because sometime a hood just gets in the way. You'll also see that there's a button in the middle. 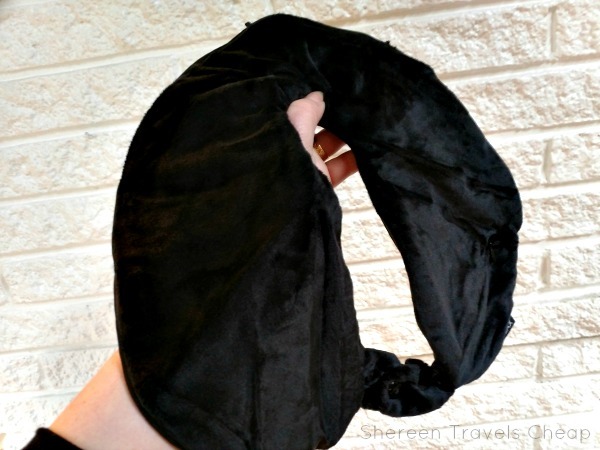 That button keeps your neck pillow in place (though you might find this a bit bulky and annoying and want to stash it in one of the other pockets). 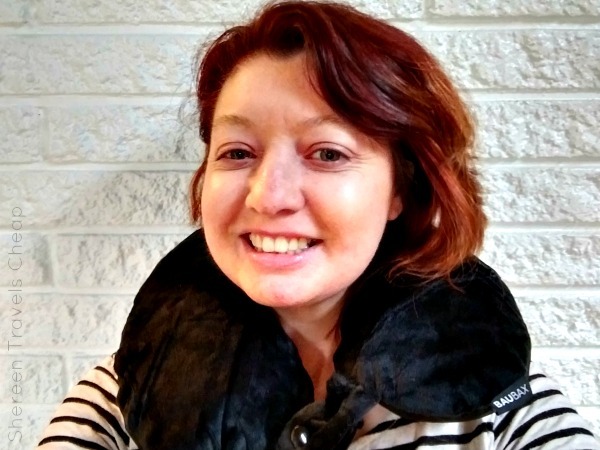 The cool thing about this neck pillow, besides how lovely and soft the fabric is, is that it hides the inflation hole in a zipper compartment. It also inflates with just two or three puffs and then deflates with a push of your finger. Nobody likes being that person who sounds like they're dying trying to inflate their pillow, or the one who has to start deflating it under their arm 20 minutes before the flight is over. I also like that there are snaps on the front, so you don't have to worry about it falling off when you move. 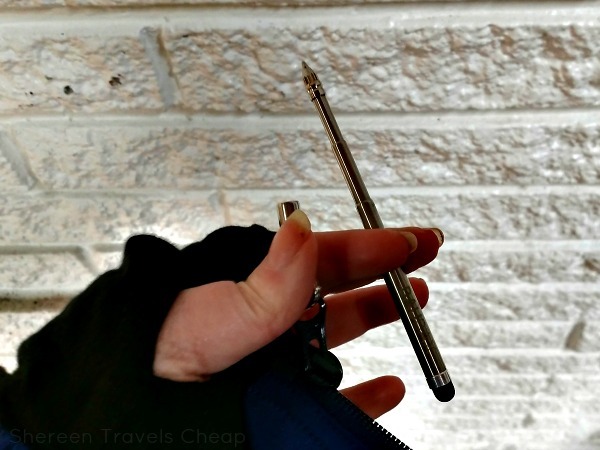 And now let's get to the totally unnecessary bonus that BauBax added, because they are cool people who know what people need during a flight: A stylus that is also a telescoping pen that clips onto your zipper with a tiny caribiner. That's crazy rad! Closed, the stylus is small and non-intrusive at all. Use it for your phone or tablet and then use the pen when you want to do the crossword or have to fill in those annoying customs forms. This jacket isn't just great for the plane and keeping all your electronics contained, but it's also fantastic when out sightseeing. You don't need to carry a purse if you don't want to and you always have a place to put smaller purchases, eliminating the need to carry a bag around all day with you. That makes it extra eco-friendly now, doesn't it? Not only is the bomber very useful, but it's great looking and won't target you as a tourist either. That's exactly the kind of clothing you want with you on a vacation. In fact, this may become your new favorite jacket, whether you're traveling or not. Where can I buy it? On the BauBax website, but there is a new Kickstarter campaign to get in on the 2.0 which will have even more and cooler features! How much is it? $179.99 for the bomber, but the hoodie and windbreaker are $149 for either men's or women's sizes. Other specs: 100% polyester, machine washable (don't forget to remove the stylus and the neck pillow), BauBax ships worldwide! 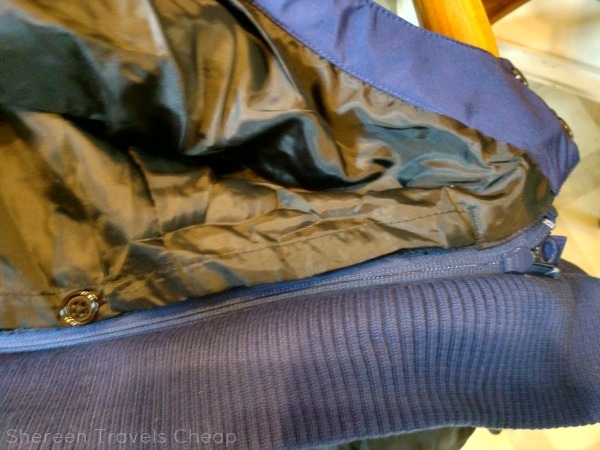 Disclaimer: I was provided with the BauBax travel bomber for the purposes of this review, but all opinions are 100% my own.